Here is our guide to the best indoor trees including popular types for low light and home offices, along with indoor fruit, bonsai and palm trees. 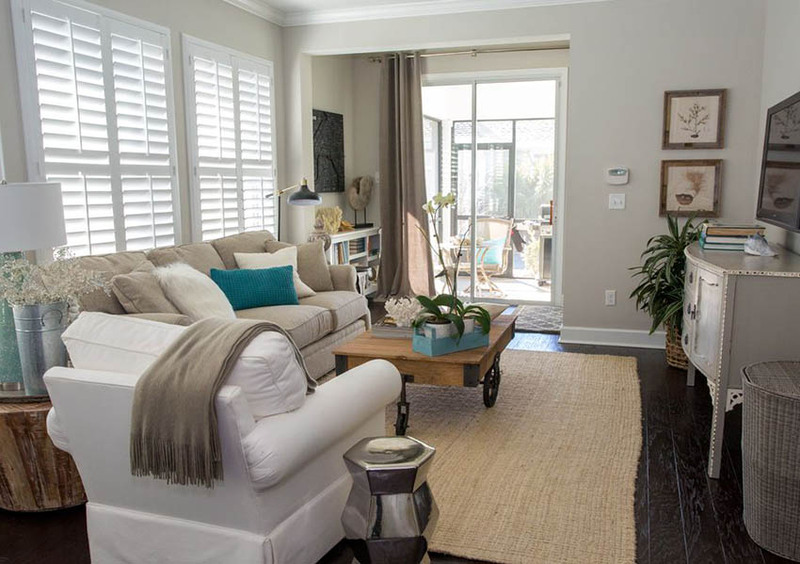 With a dose of green indoors, a home definitely becomes a much happier place. Nature’s goodness has its own charm and if you are looking to bring some of it inside, getting some indoor plants is the best thing to do. Plants have been a part of home decor since ancient times. However, other than adding beauty to homes, there are numerous reasons why plants are perfect additions to homes. Indoor plants look and feel great, but they also need a good amount of commitment and care. A lot of home owners hesitate on growing indoor plants due to low light conditions. Generally plants require adequate amount of sunlight to nourish and grow. But surprisingly there are specific indoor plants that even thrive in low light. Before you consider a plant for your home you should know the type of lighting conditions you have. A good rule of thumb in North America is that a south facing room that has plenty of windows will provide a high light environment. 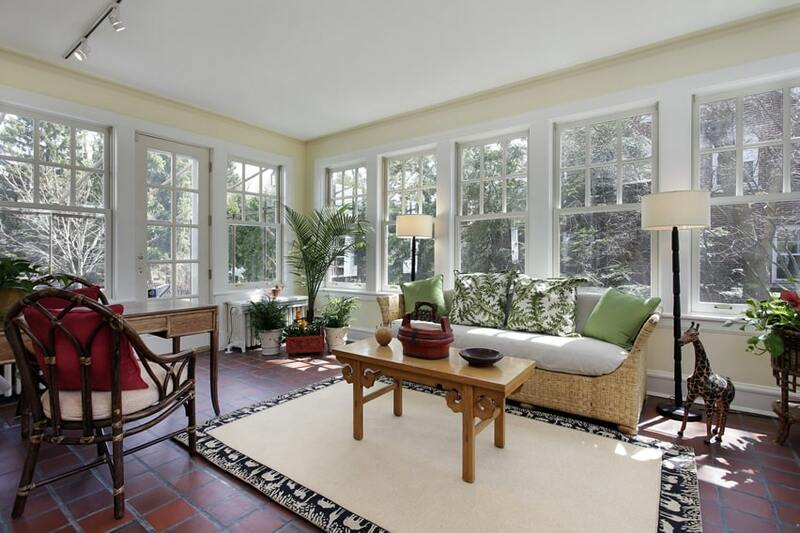 An east or west facing room with plenty of windows is generally considered medium light. While a north facing room, or rooms with small or inadequate windows are considered low light. Rooms with no windows can require you to leave a light on for approximately 12 hours a day, depending on the type of house plant. If you notice your plants suffering in this type of environment you can try rotating them to a better lit room for several weeks to see if they improve with more natural light. Most indoor trees require a lot of light and may not grow as well or as quickly in low light conditions. However, here are a few types of indoor trees that are known for doing the best in a low light room. The Dracaena marginata, or Madagascar Dragon Tree thrives in medium light but can survive in low light settings. Lower light will slow the growth of the tree and reduce leaf size, while direct sunlight can damage the leaves. 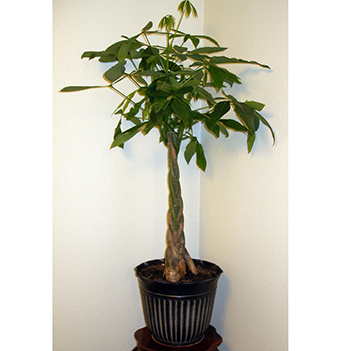 Often used in offices or reception areas and placed on a desk or table it has attractive long thin green leaves and a twisted cane that can grow up to ten feet high. The Dragon tree is considered an easier plant to care for and NASA lists it as being excellent for eliminating harmful chemicals in the air. Keep the Dragon Tree away from pets. This tree has a level #2 toxicity level for dogs and cats and is poisonous to them. Visit this page for a list of houseplants that are safe for cats. Known for their good fortune, the Mexican Fortune tree is found natively in south and central America. It’s appearance is a mix between a palm and a regular tree with its braided trunk and large green leaves at the top. Outdoors the tree will produce white flowers and edible nuts. While indoors it will not bloom. The Fortune tree is non toxic to dogs and cats and can grow up to 10 ft in height. The umbrella plant is also called the Dwarf umbrella tree has glossy oval shaped leaves with one or more central trunks. It can live in low light conditions, which may slow its growth rate, but otherwise cause no harm. Outdoors the plant grows bright red flowers, however indoors it does not bloom. The tree is also toxic to cats and dogs. The most popular ones are the ferns. Like mentioned before, ferns have been a part of home since ancient times. Almost 300 million years to be precise. Ferns come in a variety of types and not all survive in shady areas, but it’s safe to say that there are a good amount of ferns that can be grown in low light areas, making ferns the most popular choice as low light indoor plants. 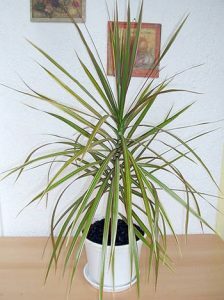 Another low light indoor plant to look out for is spider plants. Spider plants are the most adaptable indoor plants you can choose. They are low maintenance plants and can grow in low light conditions. So if you are looking out for indoor plants that can survive in artificial lights, then spider plants is your ideal choice. Décor lovers who are looking forward to doing some elegant interior landscaping for offices can move over from smaller interior plants to indoor trees. No matter how happy you are with indoor plants, large trees bring an extra dose of freshness and liveliness into an office space. We often look out for interior solutions that make office spaces look vibrant and cheerful. Indoor trees not just bring in a breath of fresh air to your office corridors, conference rooms and desks but also helps in making the surrounding less stressful and pleasing. 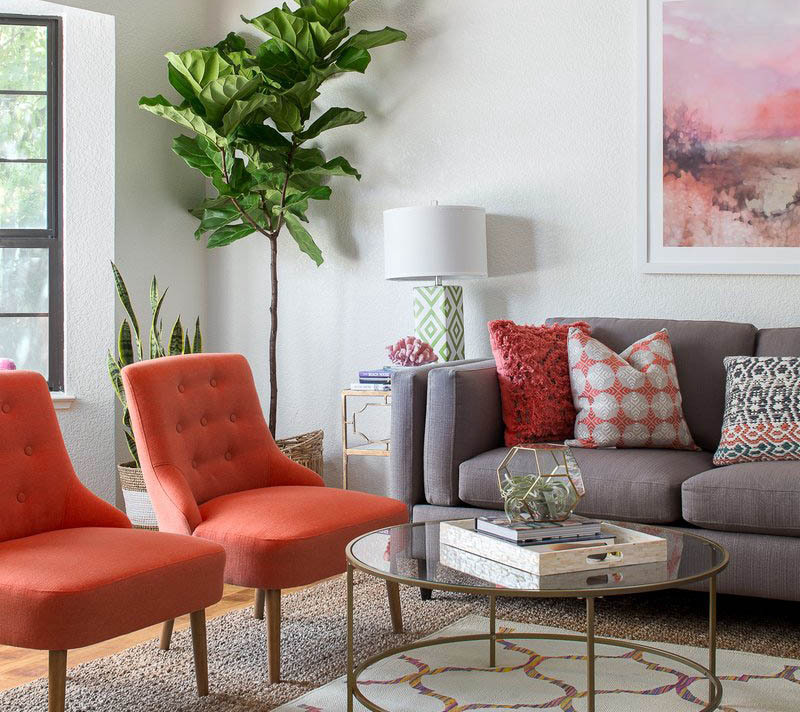 For exchange of better creative ideas and a healthy work environment, opt for indoor plants like the popular fiddle leaf fig. Its large foliage makes it one of the most appealing indoor trees. 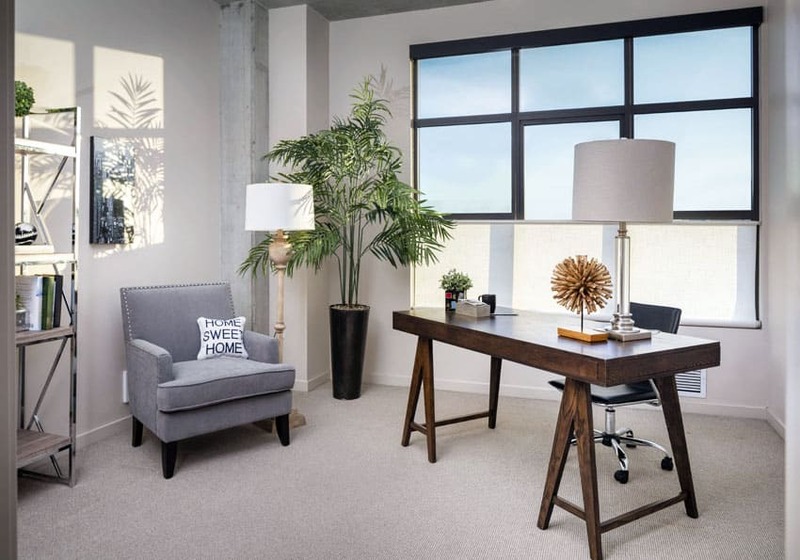 Place the fiddle leaf fig tree in your office area where it will receive good amount of indirect sunlight. The large palm plant is another good choice for offices. The good part about the fiddle leaf tree is they are quite undemanding and a lot of these types can grow in spaces that get low sunlight. Also, they can survive with little water availability, making it one of the most common choices for office spaces. For a more upscale and sophisticated look, large bamboo plants are perfect. They do require a few hours of direct sunlight and good care but it’s all worth for the kind of beauty it is. There are decorative plants and then there are edible plants, but you also have the option of growing edible indoor plants that look stunning too. Fruit plants generally grow large and wild in their natural habitats where they get good amount of sunlight and necessary nutrients from the soil. 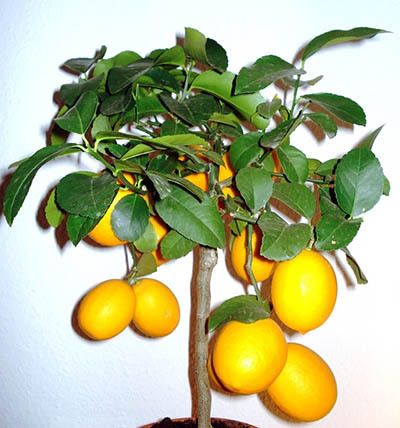 But alternatively, there are also dwarf fruit trees that can be grown indoors. The most alluring one is definitely the lime and lemon tree. This citrus plant is a happy plant that adds so much vibrance to your space. Naturally it requires ample sunlight and care for a healthy growth. Place it in the sunniest spot in your home and see how it grows to self pollinate and produce fruit. It also requires a humid atmosphere which you can provide by spraying it with water regularly. The dwarf mulberry tree is another choice for indoor fruit trees. Place it in a bright sunny spot to see it bloom to its fullest producing small berries. Opt for dwarf banana plants to not just grow edible bananas indoors but also add a touch of bright green foliage to your décor with its large exotic leaves. The indoor olive tree is a great choice for those seeking out low maintenance indoor trees. A lot of varieties are purely ornamental, so while shopping for indoor olive trees ask specifically for fruiting ones. They require at least 6 hours of direct sunlight in a day but need lesser water compared to other plants. Indoor bonsai trees are not your regular indoor greenery. Inspired by zen Buddhism, the Japanese and Chinese are the pioneers in creating dwarf bonsai trees. Used extensively by the elites in the Asian countries from the ancient times, it’s only in recent centuries that the concept of bonsai spread outside its homeland. 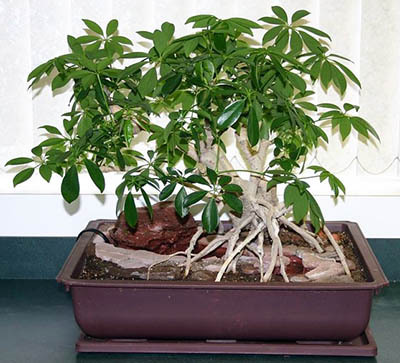 Bonsai trees have a special charm and appeal that brings in so much calmness and peace into homes and offices. A perfect house warming gift, the best décor accessory and a natural air freshener, a bonsai tree can be so much for your personal space. For beginners, the ficus bonsai is an apt choice. The best thing about ficus bonsai is that it’s tolerant to low humidity. 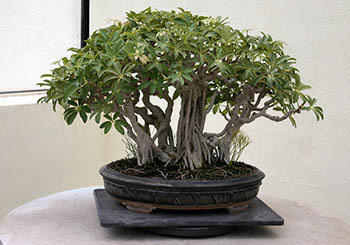 The Sageretia bonsai is another popular bonsai tree originally from China. Its small green leaves adds to its beauty while the white flowers makes way from little black fruits during summers. Let your Sageretia bonsai bask in some morning sunlight and it’s good to be indoors in shade for the rest of the day. It is sensitive to periods of droughts, so ensure it doesn’t dry out completely. The Fukien tea bonsai also has its origin in China which is popular for penjing (potted landscape made using miniature trees) in Asian countries while in western countries it’s used as an indoor bonsai. The Fukien bonsai has shiny dark green leaves with white dots on its surface. Its requires adequate amount of sunlight so place it near a window pane for ample air and warmth. It doesn’t like dryness so keep the soil wet regularly. We often see palm trees adorning public places and garden areas. If you were tempted to get them indoors then you can surely do that. Palm trees are loved for its tropical appeal and are usually thought of trees that love sunny spots to grow. However, palm trees can also be tolerant towards shade which means they can also be grown indoors. 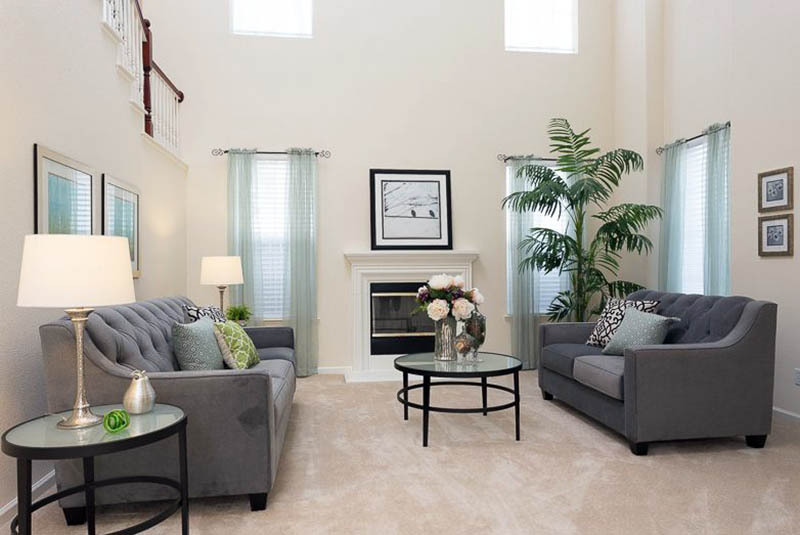 Unlike the full-fledged palm trees, the smaller versions can be a part of your living room or office cubicle too. The Kentia palm (Howea Forsteriana) is one of the easier palm trees to care for. They can readily be found to purchase in garden stores at a height of 4 to 5 feet making them great for those who want an established tree. If you want an ultra-exotic looking space then opt for the ruffled fan palm. Its spread fan like leaves looks stunning and adds so much vibrance to a space. The lady palm has beautiful segmented fan leaves which requires moderate to heavy shade making it an ideal choice as indoor palm trees.